None can replicate Nayyar saab, none can succeed him. Omkar Prasad Nayyar was born in an undivided India in Lahore in 1926. His family relocated from Lahore to Amritsar after the partition. He dropped out of college to compose music. In 1949, Nayyar came to Bombay and met producer-director Krishan Kewal who was making Kaneez. Thus his career started with scoring the background music for Kaneez. In 1951 in Delhi, Bhatia, a close friend of Nayyar s recommended him to Pancholi who was releasing Nagina starring Nutan and Nasir Khan. But Nayyar got his first break as a composer in Aasmaan. Followed were the films like Chham Chhama Chham and Guru Dutt's Baaz. Santoshi had dropped Naushad to assign Nayyar while Guru Dutt too opted for Nayyar. But his films flooped badly so he was ready to pack his bags and leave for Amritsar The next film with Guru Dutt Aar Paar was a hit and later on they worked together in Mr. and Mrs. 55. He was now in demand. Lata was the reigning playback singer. But Nayyar determinedly avoided recording with her as he felt her voice did not suit his compositions. He zeroed in on fledgling chanteuse Asha Bhosle. Nayyar had used Asha's voice only sparingly in the early years (Man mora from Mangu) preferring to concentrate on Geeta and Shamshad Begum. But from 1957, he sidelined his erstwhile favourites and lavished his best on Asha. 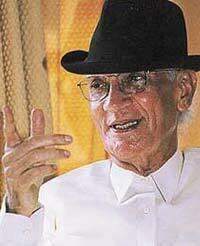 Nayyar was so involved with Asha Bhosle that he neglected other great singers like Geeta Dutt and Lata Mangeshkar. Together they created magic. In about 70 films, they scaled new heights in music. He molded Asha's voice and gave her style and respectability. The Nayyar-Asha team lifted to an unprecedented high in 1957- 1958 with around nine releases in both years and a string of successful scores like Naya Daur (for which he won the Best Music Director Award), Tumsa Nahin Dekha, Sone Ki Chidiya, Phagun, Howrah Bridge and Ragini. Nayyar became one of the earliest music directors to command a lakh for a film. His decline was as sudden and as steep as his rise. His arrogance and insistence on a high remuneration were famous. Besides his films in the 1959-1960 phase (Raj Kapoor's Do Ustaad, Dev Anand's Jaali Note) did not set the box-office on fire. In 1961, Nayyar had no releases at all. In the late 50s, his films include Tumsa Nahin Dekha and Howrah Bridge with the most famous song, Mera naam Chin Chin Choo. He also scored the Shammi Kapoor's hit film, Kashmir Ki Kali. His limited musical education did not come in the way of embellishing his melodies with well-chosen instruments like the sarangi which he popularised or the piano which ripples through Aapke haseen rukh pe from Baharein Phir Bhi Aayegi. In the early 1990s, Nayyar made a surprise comeback with Zid and the Salman Khan-Karisma Kapoor starrer Nischay, with his unmistakable tunes. Around the same time, new composer Tusshar Bhatia doffed his hat at the veteran by composing in the Nayyar idiom in Andaaz Apna Apna's Elloji sanam hum aa gaye. The maestro, in his hat, was seen many times as a guest on television shows. But O.P's beaming visage hid in his old age his characteristic stubbornness that has stood him in good stead and helped him tackle the vicissitudes of fate that has seen him move from his posh Churchgate flat to the distant suburbs of Mumbai and necessitated a profession switch from composer to homeopath. He died on 28th Jan 2007 due to cardiac arrest. Having been estranged from family they were not present for his funeral. It was as a composer that he was destined to succeed. Preetam Aan Milo - one of his private compositions sung by C.H. Atma in his soulful Saigal-esque style became a rage all over India in 1948-49. Dalsukh Pancholi - a famous film producer of that time - was so impressed by that composition that he started to look for the composer to offer him his next film. He had to search really hard as the recording company had not even bothered to mention the composer's name on the record! Resourceful as he was, Pancholi finally tracked down the elusive composer and offered him the film Aasman. The year was 1952. This debut was disastrous. Aasman, Chham Chhama Chham and Baaz - his first three films flopped in a row and even their soundtracks got a lukewarm response. Despondent and dejected, OP had almost decided to bid goodbye to film music when the genius film-maker Guru Dutt offered him a film Aar Paar (1954). That was to prove the turning point. Songs like Babuji dheere chalna (Geeta Dutt), Sun sun, sun sun zaalima (GeetaRafi) and Kabhie aar kabhie paar (Shamshad) swept the nation off its feet with their verve and vitality. The next two Guru Dutt- entertainers Mr. And Mrs. 55 and CID then firmly established OP as a trendsetter with swingers like Jaane kahan mera jigar gaya ji. O leke pahela pahela pyar and Aankhon hi aankhon mein ishara ho gaya. What made OP's music different? He shifted the then conventional equilibrium of the film song by taking away the focus from 'melody' to 'rhythm.' He was the original 'rhythm king' of Hindi film music, if you discount Ghulam Haider’s brief stint in the forties. By fusing his Punjabi folk style with Western rock 'n' roll, he invented a blend of music, which was racy and rhythmic. Pace and pep, zing and zest were its strong points. Though repetitiveness of tunes and orchestration, and frivolity of lyrics often plagued his music, it never failed to woo the listeners. What it sometimes lacked in class, it made up in catchiness. In fact this OP-brand of music had become such a rage in the late 50s that even composers of Madanmohan's caliber resorted to it on many occasions. Although initially Geeta Dutt and Shamshad Begum got the prime female solos in his music, it was Asha Bhosle who proved to be his dream voice. In fact, Asha's rise to the top was pretty much engineered by OP. He was the composer who gave her the confidence to carry entire soundtracks on her own vocal strength. Songs like Poochho na humein hum unke liye, Jaaye jahan men nazar, Yeh hai reshmi zulfon ka andhera and Bekasi hudh se jab guzar jaaye time and again proved what a great team this was. OP could also claim credit for bringing Rafi out of his sad singing image with a string of sprightly songs. OP-Raft combine in Tumsa Nahi Dekha (1957) gave Shammi Kapoor the image of an aggressive, arrogant lover with songs like Yun to humne laakh haseen dekhe hain, Chhupnewale saamne aa and Jawaniya yeh mast, mast bin piye. Whether in Tu chhat par aaja gonye for Dilip Kumar, in Main Bambai ka Babu for Johny Walker or in Pukarata chala hoon main for Biswajeet , OP's tune and Raft's voice always jelled so beautifully! Mahendra Kapoor was another singer who benefited tremendously from OP's musical genius. Songs like Badal jaaye agar maali, Laakhon hain yahan dilwale and Andhere mein jo baithe hain highlighted this composer's ability to bring out the best of any singer. In the 60s he switched tracks by emphasizing more on melody. In his orchestration too, sitar and sarangi started to dominate in this period and the dominating dholak beats which once characterised his music took a backseat. Personally speaking, I like his soundtracks from this period like Phir wohi dil laaya hoon, Kashmir lei kali. Ek musafir ek haseena. Yeh raat phir na aayegi. Saawan lei ghata and Humsaaya much more compared to his earlier work. Through these efforts he proved to one and all that his music was not only exciting and exuberant but it also could be sentimental and sensitive. That was the hallmark of a great composer. The 70s saw his musical downfall like so many masters from 50s. After delivering a brilliantly moving Chain se hum ko kabhie for Pran Jaaye Par Vachan Na Jaaye (1973) as a parting note, Asha Bhosle never sang again under his baton. OP never really recovered from this personal and professional setback. His latter day music never reached the same heights again. OP had this strong belief that a composer makes a singer and not vice versa. He was to prove that by becoming the only major music director from the golden era to succeed without even once employing the all conquering melody queen Lata Mangeshkar's vocals. Why these two great artistes never worked together is something only they could tell. Whatever might have been the misunderstanding between the two, it certainly deprived music lovers of many a gem. No words can sum up OP's true worth as a composer. What he did was something only the greats can do. He dared to go against the trend. Despite almost never having the luxury of big banners and big stars, his music managed to grab the limelight. He defined his own rules and lived by it. He refined and re-defined singers. And above all, he gave something as sublime as Deewana hua baadal and something as springy as Yeh chaand sa roshan chehera to keep us humming forever! * Ek Musafir Ek Haseena.